A few years ago, I did a blog post about a wetterhoun/golden retriever cross. 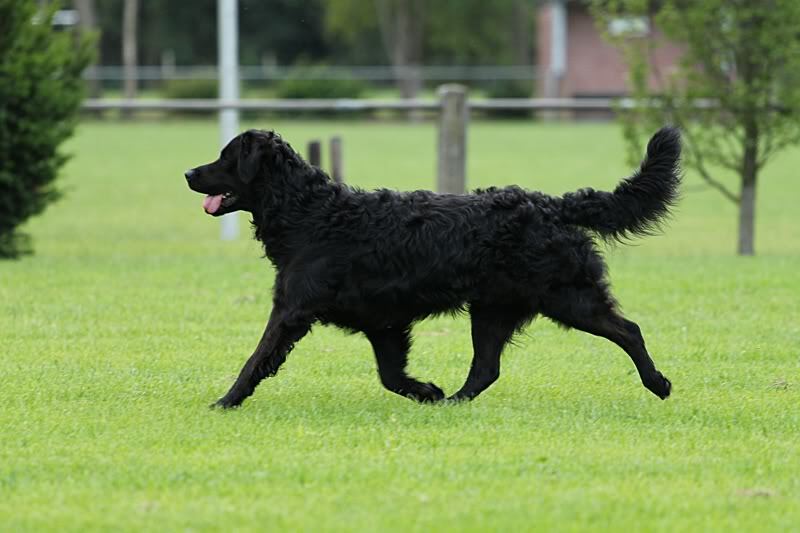 A wetterhoun, as you may recall, is a water dog from the Friesland province of the Netherlands. The dog was used to hunt otters and polecats, as well as being used as waterfowl retrievers. In function, they are very similar to the market hunter’s water spaniels or water dogs that were once common across the North Sea from Norfolk to the River Tweed. The owner of the above dog commented on my post leaving this photo of the dog in profile. The dog is much more retrievery in conformation than wetterhounesque. (I always wanted to use wetterhoun and -esque in a word). Apparently, someone has bred this cross back into golden retrievers, because here is a dog that is 3/4 golden retriever and 1/4 wetterhoun. The backcross is even more like a golden retriever. Indeed, if this same dog were seen in, say, 1890, we’d have to call it a wavy-coated retriever. I don’t know how common crossbreeding is in wetterhouns, but this is still very much a working breed in its native region in the Netherlands. 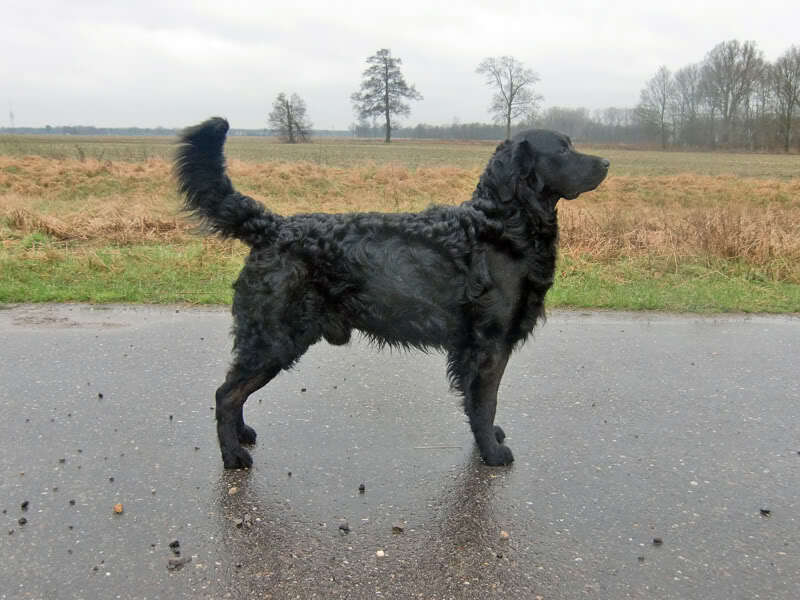 There has historically been a lot of crossbreeding between wetterhouns and the other Frisian gun dog breed, the Stabyhoun. I had heard rumors that crossbreeding between stabyhoun and wetterhoun were again happening, though on a much more limited scale, but I cannot find any record of it. If the dog in the last photo had been selected to be gold or yellow in color, I don’t think you could tell it from a purebred golden retriever. So these two breeds, though similar in function and perhaps ancestry, could be used in a backcross program without many problems. It’s just that in the dog world that exists right now, we don’t have the ability to do this with legitimacy. The answer to this “Identify” query is a golden retriever/wetterhoun cross. The golden retriever parent is the one that is very widely known. However, almost all of its identifying traits are recessive and are easily hidden when crossed with another breed. The other breed is one that isn’t well-known outside its homeland. The wetterhoun is from Friesland in the Netherlands. It is sort of like the Dutch version of the Chesapeake Bay retriever or the extinct St. John’s water dog. Like the St. John’s water, its exact ancestry isn’t known, but like both of these breeds, they were used for a variety of purposes in their homeland. The dogs were quite commonly used to hunt otters, which were deemed a threat to fish stocks, and they were used to retrieve shot birds and other game. They are also quite competent guard dogs. One theory goes that these were derived from the ancestral water dogs of the poodle type that were crossed with the dogs of gypsies and the spitz dogs of the local farmers. These dogs tended to belong to working class people, who needed gun dogs that were capable of retrieving game but also were of some use in killing rats, polecats, and otters. Whatever its origins, the wetterhoun is regional landrace of water dog. It does share a relationship with the other hunting dog from Friesland, the stabyhoun. The stabyhoun is an HPR, but it does share some relationship with the wetterhoun. Before they became standardized breeds, they were often crossed with each other. This dog isn’t a stabyhoun/wetterhoun cross. It is a cross between a wetterhoun and one of those imported breeds. Golden retrievers can kill rats. I bet they can take down a polecat or mink, but I wouldn’t bet on them taking on an otter, which is currently a protected species in the Netherlands. 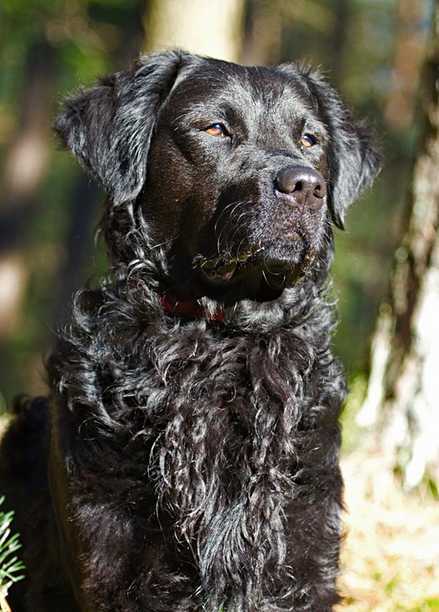 The wetterhoun is one of the last of the old regional water dog breeds still in existence. Most of these dogs have been absorbed into improved and standardized breeds, be they poodles or barbets, water spaniels, or retrievers. No one got the answer right in the initial query. This was a tricky one.